> Chicago Auto Show debut for Ford Mustang Shelby GT500? The guys at Mustag6G, a Ford Mustang forum, has spotted the Ford Mustang Shelby GT500 on the list of the new car launches for the Chicago Auto Show. 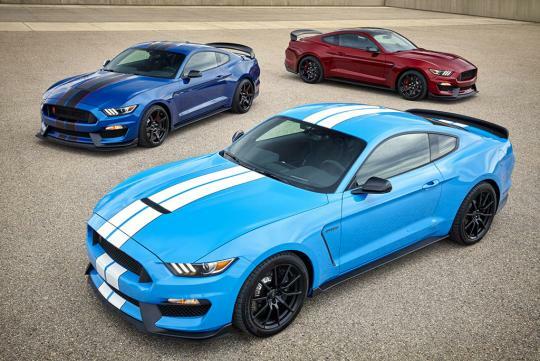 Meanwhile, the car is expected to be powered by a 5.2-litre supercharged V8 that is based on the same powerplant that drives the GT350 and GT350R shown in the photo above. With over 700bhp, the GT500 will be rivaling the Dodge Challenger SRT Hellcat and the Chevrolet Camaro ZL1. Top speed is rumored to past 320km/h. Interestingly, Mustang6G points out that the guys who are now known as Ford Performance, has a long history of Chicago show debuts. Cars that were launched there include the Mustang SVT Cobra and F-150 SVT Lightning from the 90s.